As a teacher, maybe you’ve had the experience of having a pregnant student take your class. You may have wondered how to best serve them as a student, and what was even safe to offer them. As yoga teachers, whether we prepare our classes in advance or teach to the group of students who walk into the studio, we have to always be thoughtful in how we are approaching the specific needs of our students. And yet often, whether teachers know it or not, they lose students because of their inability to support them during their pregnancy and postpartum period. With growing evidence of the health benefits of yoga for pregnant and postpartum students, more and more people are turning to yoga during this important time, yet very few teachers have any training in how to best support these students as they come to their classes. What pregnant students are looking for are teachers who have knowledge and training in how to best provide safe and supportive modifications based on the changes happening in the body during pregnancy. And following their pregnancy, students continue to look to teachers for additional support. Many changes that happen during pregnancy continue to impact the body in the postpartum period, in addition to many new changes that begin once baby is born. Through this 15-hour introduction to yoga for the pregnant and postpartum body you will learn the basics of how you can best support your students safely as a teacher. This training will teach you how to modify for your pregnant and postpartum students in class and give you the confidence to step in and sub prenatal and postnatal yoga classes. It’s also a great primer course if you are on the fence about deciding whether to become a certified pre/postnatal teacher. This training isn’t limited to yoga teachers, this training is open to yoga practitioners planning to get pregnant or currently pregnant and to birth professionals of all backgrounds. This training will help teach you how to best support the changes to the body through an asana practice or how to best provide additional support to your pregnant clients. Tuition: $325 early registration by 11/22, $385 after. Cancellation Policy: Refunds available, less a 15% administration fee, up to 14 days prior to workshop. No refunds or credits allowable after that time. 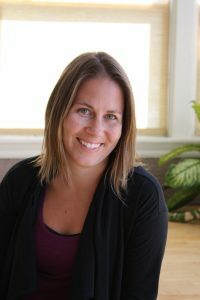 Megan Sloan has been offering prenatal and postnatal classes in the Seattle yoga community for over 10 years. She is a Yoga Alliance 500hr-RYT and RPYT (Registered Prenatal Yoga Teacher) with over 4,500 hours of teaching experience. She is also the lead faculty member of the 8 Limbs Pre/Postnatal Yoga Teacher Training and has taught Yoga for Pregnancy & Postpartum Bodies as part of other studios’ 500hr programs. She is a mama herself, and personally very familiar with just how much a yoga practice can help strengthen the body during pregnancy, how beneficial it was during labor, and how postpartum it is a tool to connect with the body, calm the mind and be strong and healthy as a parent to her daughter. She has also attended many births as a doula, and has had the humbling opportunity to witness and support mamas in childbirth in a variety of settings, from home births, to birth centers, to hospital births. Her passion for teaching yoga teachers to support folks during the perinatal period stems from her own experiences as a pregnant student, finding little support for her changing body during pregnancy and postpartum in her regular yoga classes, and from witnessing over the years the profound impact yoga has for pregnant and postpartum students. Her hope is to create accessibility for pregnant and postpartum folks to find the support they need in their local yoga communities and to experience the benefit that yoga can offer in addressing the aches and pains common in these periods and the stress relief and nervous system support that all pregnant folks and new parents need.